Winds howled and rain hammered at the sails, like the sharp rapping of a drum. Clouds boiled and twisted, as if stirred by an unseen hand. Amid this maelstrom, lightning arced across the clouds, turning night to day in the oppressive gloom. 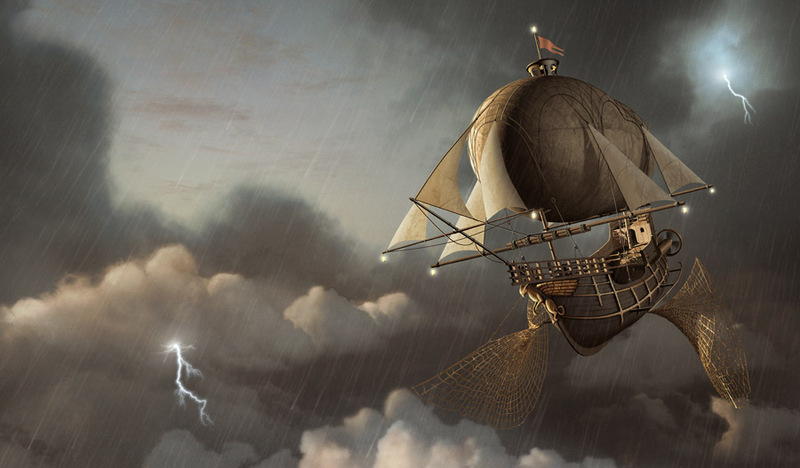 Deep among the gray, churning clouds, the airship’s cabin shook from the roar of thunder. 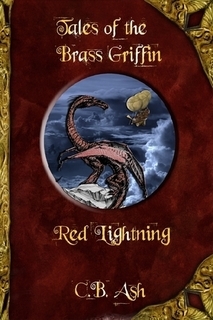 Outside, high winds beat mercilessly against the Brass Griffin’s worn wooden and copper hull. Wet rigging popped as it slapped against one another, and against the tight, wet canvas of the airship’s elongated gas bag that kept it aloft. With a heavy groan, the cabin door protested at being pulled open from outside. A tall, olive-skinned figure appeared in the doorway. Standing a good two inches past six feet, he wore a loose blue shirt, brown cotton trousers and dripping wet rain slicker. Long black hair drawn back into a rough collection of braids framed a stern face. He wiped rainwater from his eyes with the back of a sleeve. “Captain! We’ve reached the storm’s heart,” the broad-shouldered man said. Across the room, Captain Anthony Hunter memorized the page number in front of him, closing the old, leather bound volume of “King Solomon’s Mines” and setting it on a small table beside him. The captain was a tall, square-built man with thick shoulders in a plain white cotton shirt. 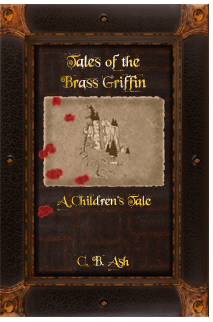 He tugged at the old leather vest he wore, the one dotted with the occasional bullet scars, to straighten it. As he did so, he reached into a vest pocket instinctively, remembering at the last moment that his pocket watch was no longer there. With a sigh, he quickly combed a hand through his brown hair, cut short in the Royal Navy style, that was touched with a hint of gray at the temples. Winds thrust at the ship again, threatening to turn the vessel broadsides. “Hail in the lower clouds, lightning here on high,” the olive-skinned crewman replied. Hunter nodded, then stood, strapping on a pair of brass-trimmed wheel-lock pistols before throwing on a worn long coat for protection against the elements. “Bad omen, that. 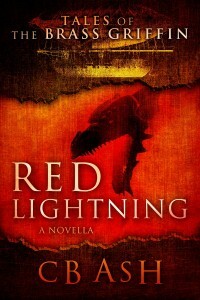 Last time it ached, a vampire had stowed away,” Whitehorse shrugged. “I still doubt the two were related. Besides, you’re only irritated because he locked you below decks,” Hunter replied. Captain Hunter ignored the phantom ache in his artificial hand and reached for a glove to tug over it. 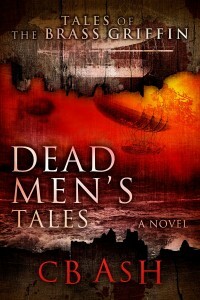 Suddenly the ship lurched violently, knocking both men off their feet. Hunter glanced around, grasping for a handhold. The room itself was a common room that joined together the officer cabins aboard the Griffin. It was a box-like, with cabinets lining the walls. A long meeting table usually dominated the middle of the floor, but had been tossed to one side against a wall. Maps and charts, normally stuffed away, were now tossed about the room. Cabinet doors stood open, their contents spilled out upon the floor. An empty bottle rolled past the captain’s boot, unnoticed. The captain’s eyes searched the air, as if he could look into the seasoned wood and copper sheets of the ship itself for any damage. Krumer, accustomed to the captain’s odd behaviors, had always accused Hunter of having the sense of a mystic when it came to ships. Anthony often ignored the remark, passing the comments down to good-natured ribbing. He simply knew his ship. Scrambling to their feet, they raced to the deck. This entry was posted on Sunday, October 5th, 2008 at 11:02 pm	and is filed under Red Lightning. You can follow any responses to this entry through the RSS 2.0 feed. You can leave a response, or trackback from your own site.